Insights How To Determine Root Causes in Your 8D Analysis. 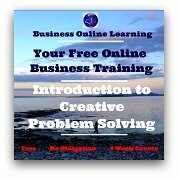 These are all the pages in the 8D Analysis / 8D Problem Solving free Business Training. 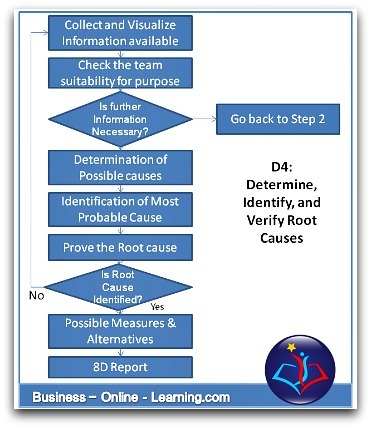 In this section of the 8D Analysis, we look at the steps necessary in completing D4 of the 8D report; determining the root cause of the problem. Start out by collecting as much information as possible and making it visual in any way possible. Identify all possible causes that could explain why the problem has occurred. Also identify why the problem was not noticed at the time it occurred. Ensure that once you feel you have found possible root causes, you must verify them. Were these really the cause of the problem? Perhaps they were not - only in combination with some other event did this problem occur? It goes without saying that this is an extremely important step for the successful prevention in this issue ever arising again. Nailing the root cause on the head. Is the team still suitable for the task at hand? Is a complete assessment or problem analysis available? Are all changes to the process or products completely analysed? Has an analysis of possible causes been carried out? Are the possible causes tested to verify that they are a possible cause? Is there Data on these possible causes so that a quantitative analysis can be carried out? Are the possible causes verified? Has all documentation been completed? This is the Fourth section of our form. This template is downloadable from our Resources page. This section of the 8d report is to document the exact details of all root causes as determined by the team. It is important to document these details for legal and potential liability reasons: Should the 8D process not bring the desired results, the customer may, at most, sue your company or at the very least, move their business elsewhere.